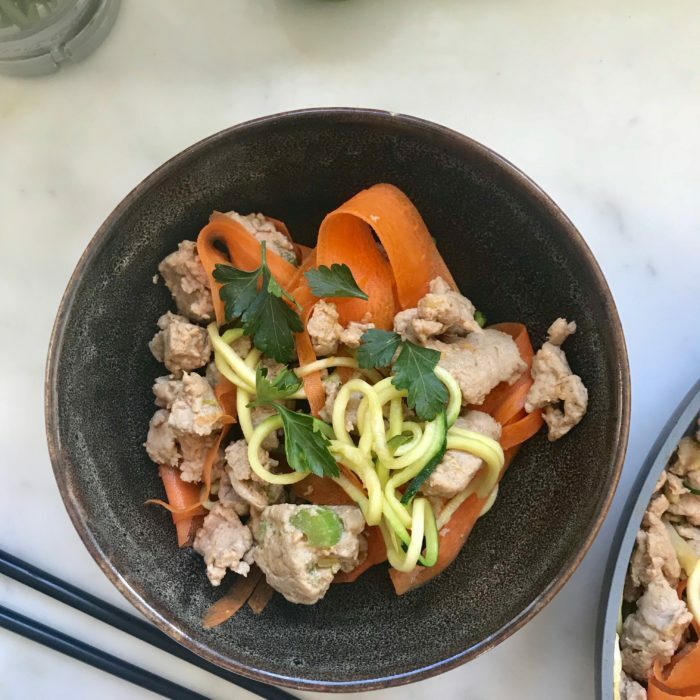 This asian flavored dish is so easy to prepare and so fun with the carrot and zucchini noodles! You can always add brown rice, coconut rice, eat it in lettuce cups if you feel that this will not be enough. Make the veggies noodles using a spiralizer or a vegetable peeler. If you are not familiar with this process, it means that you have to peel the carrots first and then make thin slices using the peeler until you run out of veggies. Repeat with the zucchini. Sauté the onion, garlic, ginger and celery with 2 tbsp of avocado oil for a few minutes. Add the turkey and keep stirring until the meat is golden brown. Add the sauce and the veggie noodles, toss together and let it simmer for 2-3 minutes. Add the lime zest and juice. Serve in bowls and top with some roasted peanuts and cilantro. This would be delicious in lettuce cups, on a bed of brown rice or on its own.